The technical data contained herein are guides to the use of HI-FLOAT and SUPER HI-FLOAT. The advice contained herein is based upon tests and information believed to be reliable, but users should not rely upon it absolutely for specific applications. It is given and accepted at user's risk and contirmation of its validity and suitability in particular cases should be obtained independently. It is strongly recommended that the user test HI-FLOAT and SUPER HI-FLOAT for suitability under actual end use conditions. In 1982 Marjorie Burchette opened a small balloon delivery shop in Louisville, Ky. She quickly noticed a large number of complaints from customers who were unhappy because their balloons floated less than a day. She asked me if I could do something to make the balloons float longer. I am her husband and was employed at the time in the Research and Development department of a large chemical company. I went to work on the problem at night in my basement shop, and after about a year developed HI-FLOAT. The rest is history; HI-FLOAT has become a phenomenal success. In 1992 we introduced an improved formula, SUPER HI-FLOAT, which works twice as well. We continue to grow as HI-FLOAT users capture an ever-growing share of the balloon market by providing a higher quality product that lasts several times longer. HI-FLOAT and SUPER HI-FLOAT are water soluble plastics specially formulated to hold in helium. They dry inside the balloon to make a very thin coating on the rubber. When used properly, HI-FLOAT increases the floating life of your balloons by about five times and SUPER HI-FLOAT increases floating life about ten times. This booklet contains tips for using HI-FLOAT and SUPER HI-FLOAT, and answers all of the most frequently asked questions. In addition, for the more advanced user we have included several fun balloon designs and design tricks. Some examples are how to make confetti balloons, how to turn a white balloon into a colorful marbelized balloon using food coloring, how to make spider webs inside clear balloons for Halloween, etc. HI-FLOAT can also be used to coat the outside of balloons to keep them from oxidizing. Instructions are given for two different techniques for doing outside coatings. We sincerely hope you find this booklet helpful. If after reading the booklet you still have any questions or problems, please phone us at (800) 57-FLOAT or write to the HI-FLOAT Co.; 13025 Middletown Industrial Blvd. ; Louisville, KY 40223. We will do everything we can to help you. We wish you every possible success! HI-FLOAT and SUPER HI-FLOAT are aqueous solutions containing a special water soluble plastic. It dries inside the latex balloon to form a barrier coating which helps hold in helium. This coating greatly increases the floating life of the balloon. A simple rule of thumb is that you may use either HI-FLOAT or SUPER HI-FLOAT if the coating is on the inside of the balloon. SUPER HI-FLOAT will give double the floating life of regular HI-FLOAT under any conditions. Therefore use SUPER HI-FLOAT whenever you want the maximum floating life possible. Since balloons float less in hot or humid weather, we recommend you always use SUPER HI-FLOAT under these conditions. If you are coating the outside of the balloon to prevent oxidation or to glue things to the balloon such as confetti, use regular HI-FLOAT. Yes. HI-FLOAT and SUPER HI-FLOAT are non-toxic, non-irritating, non- corrosive, non-flammable, and biodegradable. They are very similar to the adhesive found on the back of postage stamps. Wash off the skin with water. If accidentally splashed into the eyes, flush with water for several minutes. Although it is non-toxic, it is a good idea to keep bottles away from small children. When used properly, HI-FLOAT increases the floating life of latex balloons by about five times and SUPER HI-FLOAT increases floating life about ten times. The following table shows typical floating lives for various sizes of balloons. Please remember that these are estimates for typical indoor conditions. Flying time will be less outdoors. Flying time varies greatly due to factors such as latex quality, humidity, temperature, altitude, etc. Balloons typically float half as long in hot, humid weather. For maximum floating life, hand-tie balloons. SUPER HI-FLOAT not recommended for this size and shape balloon. for Geo Donuts® and Blossoms®. Use blue clip for metallic, pearlized and 17" hearts. Use two strokes with the yellow pump clip to treat 24" balloons. Slide the balloon onto the pump outlet as far as it will go in order to inject the HI-FLOAT deep inside the balloon as shown in Figure 2. Depress the pump plunger as far as it will go. Remove the balloon from the pump. Wipe the pump nozzle with the balloon as you remove it in order to keep the nozzle dry. Place the balloon on a flat surface while holding the opening upwards to prevent dripping. Gently rub the balloon a couple of times as shown in Figure 3 to spread the liquid over the inside surface. Mash down any lumps of liquid to make the coating as uniform as possible. Make sure the entire inside surface of the balloon is wetted except for the stem which contains the opening. Inflate the balloon in the usual manner and hand tie. We recommend rotating your helium nozzle downwards as shown in Figure 4 to reduce splatter and help keep the liquid out of the balloon stem. A key to minimizing mess when using HI-FLOAT is to keep it out of the balloon stem where it can leak onto the hands when tying. When the balloon is first inflated it should float up straight but it will not be very buoyant until the HI-FLOAT dries which takes a couple of hours. After drying the balloon will have nearly as much upward pull as an untreated balloon. If the balloon does not float, or leans to one side when first inflated, see instructions on page 10. With a little practice you should be able to treat balloons neatly and quickly. If a treated balloon bursts before the coating dries it can be messy and cause a complaint. A method was developed by a number of HI-FLOAT users to solve this problem called the "dry" method because the coating is allowed to dry overnight before the balloon is given to a customer. If a balloon pops there is no mess. Balloons float well initially since the dried coating weighs very little. Gives the maximum floating life possible. Balloons are less likely to burst. Eliminates uneven spots of liquid sometimes visible in clear balloons before drying. Step 1. At the end of the day treat enough balloons on the inside with HI-FLOAT to cover the next day's orders. Inflate the balloons with helium and seal with plastic clips or discs. Step 2. Allow the balloons to dry overnight. In the morning remove the clips and give the balloons an extra shot of helium to regain their full size. Hand-tie the balloons. This results in a fully inflated balloon coated with HI-FLOAT which is completely dry. If a balloon accidentally pops there is no mess! The key to this method is to keep the HI-FLOAT out of the stem of the balloon so it can be reinflated the next day. Inject the liquid deep inside the balloon then pinch the stem closed when rubbing the balloon to spread the coating. Be sure to treat extra balloons for those unexpected orders. Giving the balloons a shot of helium the next day is quick and easy with a little practice. Many balloon shops use this method to treat every balloon they sell. A dilute HI-FLOAT coating may be applied to the outside of a latex balloon after it is inflated to keep it from oxidizing (turning chalky). This is especially useful for those arrangments where items such as stuffed animals are put inside of clear balloons and it is important that the balloon remain clear for a long time. Treating the outside of an air-filled clear balloon will keep it bright and clear for several weeks if it is cared for properly. Fig. 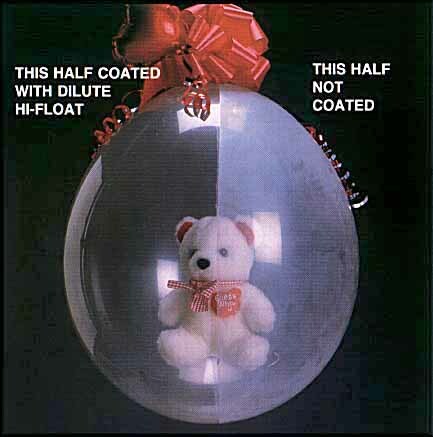 5 shows a bear in a balloon where one-half of the balloon has been coated with HI-FLOAT. The treated half remains clear even after several weeks! The uncoated half started turning chalky in a few days. Warning: Air-filled balloons having an external coating of HI-FLOAT must be kept in an air-conditioned location in hot weather. Exposure to heat and/or high humidity can cause the balloon to burst or deflate prematurely. SUPER HI-FLOAT is worse in this regard. Therefore we recommend using regular HI-FLOAT for all coatings on the outside of balloons. 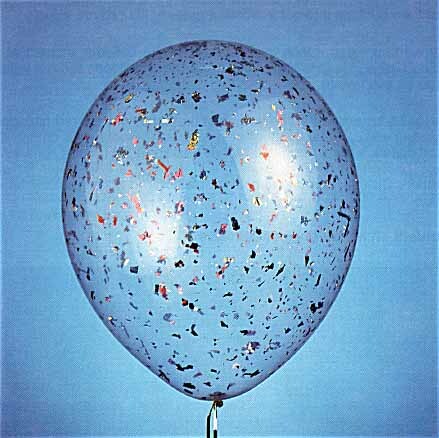 This dilute coating method does not work well on helium filled balloons since it can cause streaking. Step 1. Before inflation dip the balloon into a glass containing a liquid dish washing detergent and water. Swish it around to wash the bal loon. Step 2. Inflate the balloon and stuff it as usual. Step 3. Attach the stuffed balloon to a cup and stick to provide a handle. Step 4. Mix one cup of HI-FLOAT with two cups of warm water. Stir gently to avoid making foam. Step 5. Place the balloon in a large pan and gently pour the liquid over it while slowly rotating the balloon as shown in Figure 6. Make sure the entire outside surface of the balloon is wetted. Step 6. Hang the coated balloon up by the handle so that it can drip and dry. Under normal conditions drying takes about 30 minutes. Left half coated on the outside with dilute HI-FLOAT remains clear and shiny. Uncoated right half is heavily oxidized. Drying can be quickened by using a hand held hair dryer. Do not aim the blower at one spot too long since this could burst the balloon. The liquid which drains into the pan may be placed in a capped bottle and saved for reuse. Refrigerate during storage to keep mold from forming. Any bubbles in the coating will collect at the lowest point. Wipe this spot gently with a damp sponge after drying about 15 minutes. After drying, touch up any missed spots with a small brush. Do not dilute the HI-FLOAT more than two parts water to one part HI-FLOAT. A more dilute solution will not wet the balloon surface properly and the final coating will be spotty. Never dilute HI-FLOAT for coating uninflated balloons since this will drastically reduce floating life! Use the diluted material only for coating balloons which are already inflated. This outside coating will remove oxidation which has already occurred. This technique will keep balloon animals made from twisted 260 balloons looking big and shiny for several days. Simply place the animal in a pan, pour the diluted mixture over it, and hang it by the knot until dry. This method is a quick way to apply a HI-FLOAT coating to the outside of balloons before they are inflated. It can be used for helium-filled balloons. This method gives the usual increase in floating life but has the added advantage of keeping balloons from oxidizing for an extended period. The coating usually dries in a few minutes. A disadvantage of this technique is that it is somewhat messy. Step 1. Place an uninflated balloon over a pencil and dip the balloon into a glass of HI-FLOAT to the stem as shown in Figure 7. Keep the liquid out of the inside of the balloon. Make sure the entire outside of the balloon is wetted except for the stem. If folds form in the balloon withdraw it from the liquid and then redip it to wet the entire outside. Step 2. Remove the balloon from the liquid and let it drain for two to three minutes. Step 3. With the helium nozzle pointed downward as shown in Figure 8, slip the balloon onto the nozzle and inflate it while the balloon is still wet. The balloon will stop dripping as soon as inflation begins. It will dry within a few mintues. Step 4. Seal the balloon and attach a ribbon. Try not to touch the balloon except near the stem until it is dry. Under normal conditions you should see at least a five-fold increase in the floating life of your balloons when using HI-FLOAT and a ten-fold increase using SUPER HI-FLOAT. In low humidity weather, such as win ter, the increase in floating life will be at a maximum. It is normal for treat ed balloons to float only half as long in summer as they do in winter because of higher heat and humidity. Use SUPER HI-FLOAT. It gives twice the floating life as regular HI-FLOAT under all weather conditions. Add the full recommended amount of HI-FLOAT. Use the blue pump restrictor clip for 11-inch balloons. Adding less HI-FLOAT will shorten floating life. Inflate the balloons fully. The balloon should float straight up when first inflated. If it leans to one side or doesn't float at all, you probably have not inflated the balloon large enough. It is normal for the balloon to not have much upward lift when first inflated. However the upward pull will increase as the balloon dries over a couple of hours. In hot weather keep balloons in an air conditioned location for at least the first few hours after inflation so they may dry quick ly. The lower humidity speeds drying. HI-FLOAT does not begin to hold in helium until it dries. Ideal drying temperature is 72 to 8O°F. Never put balloons inside a plastic bag since this will interfere with drying. Do not place balloons in a hot car or van. Run the air conditioner first to cool things down. In cold weather keep balloons in a heated location for the first few hours after inflation. If it is too cold the balloons will not dry fast enough. Typical room temperature is adequate. Pearlized and metallic colors float about a third less than regular colored balloons. If you need the maximum floating life possible, don't use pearlized or metallic colors. Also, heart shaped, Geo Blossom® and Geo Donut® balloons float much less time than regular balloons. See additional instructions for treating these balloons on page 11. Clear or transparent balloons float about 25 percent longer than solid colored balloons. Metallic and pearlized colors float about a day less than other treated latex balloons. Heart shaped and doughnut shaped balloons float less than half as long due to their shape. One final caution on floating life. Balloons inflated when the helium cylinder is almost empty (less than 300 pounds pressure) may not float as long as balloons inflated from a full cylinder. Treated balloons should float straight up when first inflated. If your balloon does not float straight up or leans to one side, then you either have too much HI-FLOAT in the balloon or not enough helium. Check to make sure you are using the correct restriction clip on the pump and that you are not using a helium/air mixture to fill the balloon. Make sure the balloon is fully inflated. The balloon should be inflated until it begins to become pear shaped. Some people first inflate their balloons with air to stretch them. They then inflate them with helium. This allows the balloon to be inflated to a larger size. If the balloons still do not float well initially, then either don't push the pump down all the way or switch to the next longer size restriction clip. This will reduce the amount of HI-FLOAT injected into the balloon. However, it will also give less floating life. Your balloons will get more buoyant as the HI-FLOAT dries. When completely dry, the balloon will float with nearly the same upward force as an untreated balloon. When using HI-FLOAT or SUPER HI-FLOAT in clear or transparent balloons, some uneven runs of liquid may be visible initially. These will gradually disappear as the coating dries. This splatter can be minimized in a number of ways. Try inflating the balloon more slowly with the helium nozzle pointed in a downward direc tion. Also, when rubbing the balloon to spread the coating, rub gently to avoid working bubbles into the liquid. If the HI-FLOAT or SUPER HI-FLOAT is very old and has begun to get very thick and stringy (gel) it will be more visible inside the balloon. This gel can be redissolved by heating as described on page 13. When treating balloons to decorate large areas such as reception halls, shop ping centers, etc. it is always a good idea to test a few balloons beforehand in the actual location where the decorations will be in order to determine the actual floating life under these conditions of humidity, temperature, etc. In hot, humid weather many problems can be avoided if the air conditioning system can be left on while the decorations are up. If this is not possible, at least make sure the air-conditioning is on for the first few hours after the decorations are finished. This will speed drying and will give a much longer floating life. Spiral arches filled with helium are difficult to do using HI-FLOAT or SUPER HI-FLOAT since the balloons are bundled together and do not dry quickly enough for a long float life. We recommend simple balloon arches instead. Or, use an air-filled spiral arch supported on PVC pipe. Step 1. Inflate the balloon fully with air to stretch it, then deflate it entirely. Step 3. Rub the balloon to spread the SUPER HI-FLOAT around. Step 4. Inflate the balloon as large as possible with helium and hand-tie. Method 1. Inject the SUPER HI-FLOAT into the balloon the day before it is to be inflated, using the correct pump clip. Rub the balloon in the nor mal manner to spread the SUPER HI-FLOAT around when it is injected into the balloon. Treat several balloons in this manner and then gather them together by placing a rubber band around their necks to keep the SUPER HI-FLOAT from drying out. The next day briefly rub the balloon a second time and then inflate with helium. Method 2. (will give about the same increase in floating time as above.) Inflate the balloon with air to stretch it. Then deflate the balloon, treat it with SUPER HI-FLOAT in the normal manner, and inflate with helium. HI-FLOAT and SUPER HI-FLOAT work well on all major brands of latex balloons. However, occasionally we find a balloon which has an oil coating which interferes with the HI-FLOAT wetting the inside of the balloon. When this happens the HI-FLOAT or SUPER HI-FLOAT "beads up" similar to water on a freshly waxed car. In this case treatment gives very little increase in floating life. The only solution is to use a different brand of balloon when using HI-FLOAT or SUPER HI-FLOAT. Shortly after inflating a balloon you may notice a haze or cloudiness on the inside of the balloon. (Oxidation occurs on the outside of the balloon.) This may be caused by adding less than the full recommended amount of HI-FLOAT or SUPER HI-FLOAT. Make sure you are using the correct colored clip for that size balloon. Allow adequate drying time for balloons to avoid clean-up jobs. We recommend drying a couple of hours before giving to customers. HI-FLOAT and SUPER HI-FLOAT are completely soluble in water, even after they have dried. They dissolve much quicker in hot water. On nonporous surfaces such as counter tops, allow spilled liquid to dry then simply peel it up and discard. On machine washable fabrics wash in warm or hot water if possible. Presoak a few hours if the HI-FLOAT has completely dried. For dry cleaning, you must inform the cleaner that the spot is soluble in water and/or steam. On upholstered fabrics the HI-FLOAT and SUPER HI-FLOAT can be removed by dipping a toothbrush into a cup of hot water and rubbing the spot to soften it. Then blot with a dry towel. Repeat wetting and blotting several times as necessary. After drying, if any trace remains, repeat the procedure. Brush felted fabrics to restore nap. A dark green mold can grow on the surface of HI-FLOAT or SUPER HI- FLOAT in a bottle which has been opened for several months. This is very similar to the mold which grows on bread. If this happens scoop off and discard the discolored material. Quickly use the remainder of the bottle. Do not pour the small amount left in an old bottle into a new bottle since this can seed the new bottle with mold. Wash off the pump when transferring to a new bottle. If mold is a recurring problem in your area, purchase HI-FLOAT or SUPER HI-FLOAT in the quart size since this will be used more quickly. Unscrew the top of the pump and place both sections in a pan of hot tap water. Let stand overnight. Rinse the pump parts with warm water. Make sure the air holes under the threaded cap are clean. Reassemble. Normally HI-FLOAT and SUPER HI-FLOAT have the consistency of honey. However, with excessive age it can begin to gel and will get very thick and lumpy. If your product becomes too thick to pump, it can be redissolved by heating as follows. Remove the pump or cap and place the bottle in a pan of water as shown in Figure 9. Boil the water in the pan for about two hours. This will heat the liquid sufficiently to dissolve any gel. After cooling, the HI-FLOAT should remain flowable for years. Place a one-inch layer of gravel or glass marbles in the bottom of the pan as shown in Fig. 9 to keep the plastic bottle from touching the pan during heating. Do not allow the water in the pan to boil dry since this will melt the plastic bottle. Do not heat the bottle without first removing the pump or bottle cap since this could build up pressure and rupture the bottle resulting in burns or serious injury. Heat only an open bottle. Do not heat HI-FLOAT directly with gas or electrical heat since this will scorch the HI-FLOAT and ruin it. The HI-FLOAT must be heated by placing the bottle in a pan of heated water as shown in Figure 9. Never heat HI-FLOAT in a microwave oven. Allow the HI-FLOAT or SUPER HI-FLOAT to cool to room temperature before handling to avoid the possibility of burns or injury. HI-FLOAT and SUPER HI-FLOAT are not toxic. They are very similar to the adhesive found on the back of postage stamps. Although non-toxic, keep out of the reach of children. If splashed into the eyes flush with water for several minutes. The shelf life of HI-FLOAT or SUPER HI-FLOAT is at least a year after purchasing for unopened bottles and at least three months after the bottle is opened. Use your oldest material first to avoid accumulating product with excessive age. How many balloons will a gallon treat? 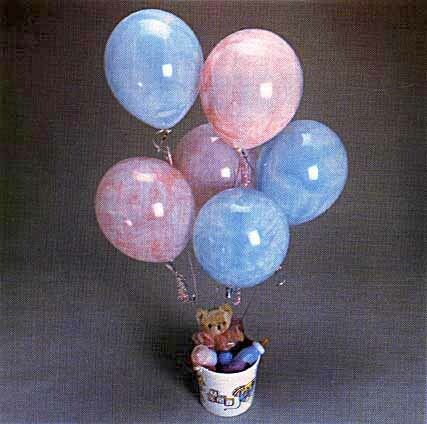 One gallon of HI-FLOAT or SUPER HI-FLOAT will treat the following number of balloons. How much does it cost to treat a balloon? The cost per balloon is shown below. This is based on a purchase price of $29.00 per gallon. Most people charge extra for treated balloons. By charging just 25 cents extra to treat a balloon, you will earn over $100.00 extra profit for each gallon of HI-FLOAT you use! How much to use in giant balloons? For maximum floating life keep balloons in a place of low humidity the first several hours after inflation. Does altitude affect floating life? Yes. At high elevation less HI-FLOAT or SUPER HI-FLOAT should be used in order for the balloons to float well initially. Use the next size larger pump restriction clip than recommended in the instructions. Or, use the technique for heart shaped balloons explained on page 11. Does HI-FLOAT work on Mylar balloons? No. Mylar balloons are not buoyant enough and will not float when treated. For very long floating life we recommend a 16-inch latex balloon treated with SUPER HI-FLOAT. Freezing does not affect the performance of HI-FLOAT or SUPER HI-FLOAT liquid. Allow it to thaw for about a day at room temperature before using. If balloons are to be taken outdoors in extremely cold weather (below 0°F or -18°C) use regular HI-FLOAT instead of SUPER HI-FLOAT. What causes a large percentage of balloons to sometimes burst? Sometimes, for no apparent reason several balloons begin bursting. This may be caused by static electricity brought about by changing weather conditions. This happens with or without HI-FLOAT. Try spraying "Static Guard" around your work area to reduce balloon loss. Further questions can be answered by your distributor or by phoning or writing the HI-FLOAT Co., 13025 Middletown Industrial Blvd., Louisville, Ky. 40223. Phone toll free (800) 57-FLOAT. You may also purchase the HI-FLOAT Tips and Designs Video from your distributor or by calling the HI-FLOAT Co. directly. Try this technique to make some beautiful marbleized balloons that resemble dyed Easter eggs as shown in Fig. 10. Use the white clip on the pump to add HI-FLOAT or SUPER HI-FLOAT to the inside of some 11-inch white latex balloons. Next add 2 or 3 drops of food coloring to the balloon such as red, yellow, or blue. At first try just one color per balloon. Rub the outside of the balloon to mix the food coloring and HI-FLOAT and spread it around. Next inflate the balloon with air or helium in the usual manner. If you don't like the color pattern, deflate the balloon, rub it some more, and then reinflate it to get a different pattern. No two are alike! For a more elegant look use pearlized white balloons instead of plain white. Use a little less HI-FLOAT since these balloons will not inflate as large as plain white. You will be surprised at the beauty of these custom colored balloons. By blending you can make any color you want. The colors will darken slight ly on drying. If "runs" form use slightly less HI-FLOAT. For a variation, use clear balloons instead of white ones and add a little glitter for added sparkle. Or, use with pastel colored balloons to achieve many beautiful colors. The very festive and eye-catching arrangement shown in Fig.11 can be made by putting colored Mylar confetti in balloons as follows. Add HI-FLOAT or SUPER HI-FLOAT to 16-inch clear balloon using the blue pump restriction clip. Rub the outside of the balloon in the usual manner to spread the coating over the inside surface. Then blow a puff or air into the balloon so the sides are not touching. Next add about one-third of a cup of chopped mylar or other soft confetti into the balloon through a canning funnel. You can make this confetti by cutting up some old Mylar balloons which have popped, or you may buy it already chopped from several distributors. Then inflate the balloon with helium to about the size of a grapefruit. Shake it vigorously to spread the confetti uniformly around inside the balloon. Finally, inflate the balloon the rest of the way with helium and tie it with rainbow curling ribbon. Attach several of these balloons to a bottle of jelly- beans for a really colorful arrangement. The key to getting the confetti uniformly spread over the inside of the balloon without forming "clumps" is to avoid rubbing the balloon after the confetti is added. Instead, inflate the balloon slightly and shake it. 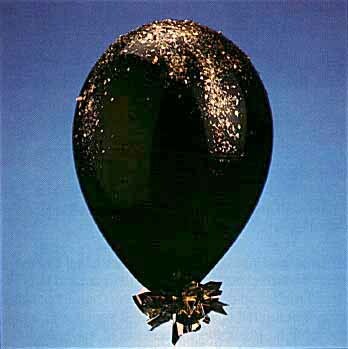 This same technique can be used to put sparkling "glitter" inside the balloon. Note: It is always a good idea to wear protective eyewear when working with confetti. To make balloons with confetti on the outside as shown in Fig. 12 place the balloon to be coated on a pencil as shown in Fig.7 and dip it into a glass of pure HI-FLOAT. Withdraw the balloon and let it drain a couple of minutes. As you inflate the balloon it will stop dripping. The outside coating of HI- FLOAT will remain wet and sticky for about twenty minutes. You can sprinkle confetti or glitter on the outside of the balloon during this time. Be careful not to use too much or the balloon will get heavy and will not float. Since the balloon is still wet you will need to be careful to tie it without touching the sides and you will want to keep it from touching other bal loons for about a half an hour. Warning: Air-filled balloons having an external coating of HI-FLOAT must be kept in an air-conditioned location in hot weather. Exposure to heat and/or high humidity can cause the balloon to burst or deflate prematurely. 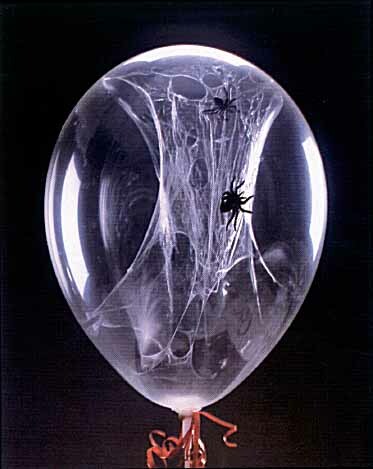 For a really great item at Halloween make some clear balloons with spiders and webs inside as shown in Fig. 13. First inject a little less than the usual amount of HI-FLOAT or SUPER HI-FLOAT in an 11-inch clear balloon, and rub it around to coat the inside. Next put a small rubber spider in the balloon. Then inflate the balloon to about 75 percent of the full size with air, and seal it with a plastic disc or clip. Let dry overnight. Place the balloon out in the open where there is good air circulation. It must be very dry in order to form the spider web. The next day remove the clip and deflate the balloon. Hold it by the stem and the top as shown in Fig. 14 and stretch it a few times to separate the dry film from the wall of the balloon. Then slowly inflate it with helium. When it gets to about full size the HI-FLOAT film will separate from the wall in several places and hang inside the balloon to form a spider web. If the coating does not separate, deflate the balloon, stretch it a couple of more times and reinflate it. This takes a little practice, but once you've mastered it almost every balloon turns out beautifully. Since the HI-FLOAT coating inside the balloon is no longer intact, the balloon will not have an extended floating life. A long lasting product can be made by inflating the balloon with air instead of helium and putting it on a cup and stick. Use the dilute coating technique on the outside to keep it from oxidizing. It should last for weeks. Step 1. Treat the inside of the 16-inch clear balloon with SUPER HI-FLOAT using the green clip. Inflate the balloon with helium and seal with a plastic clip or disc. Step 2. Allow the balloon to dry for at least twenty-four hours. Then remove the clip, letting only a little helium escape. Insert the smaller 5-inch balloons or the 11-inch balloon. Replace any lost helium and hand-tie the 16-inch balloon. Note: the SUPER HI-FLOAT should be completely dry inside the 16-inch balloon before inserting smaller balloons. HI-FLOAT and SUPER HI-FLOAT are effective if used as instructed. With the exception of this warranty, there are no other warranties, express or implied, including warranties of merchantability or fitness for a particular purpose. The HI-FLOAT Com pany cannot be responsible for use of the product after purchase. Purchaser's remedies shall be limited to refund of purchase price and, in no event shall the HI-FLOAT Company be liable for any amount in excess of the original purchase price of the product or for any incidental or consequential damages. HI-FLOAT and SUPER HI-FLOAT are registered trademarks of the HI-FLOAT Co., Inc.